If you have any questions or want to enquire about dates, use our form to contact Magdalena Paramés or see their website for more information. Nothing but birdsong and a local dog or two will disturb your peace. Wend your way up to this old granite cattle shed, perched on top of a hill with long valley views and crack open your bottle of wine from Magdalena’s vineyard. She has cleverly revived this two-storey cottage for two (or four with the sofabed). Upstairs is the sunny bohemian living space – yellow walls, wooden vaulted ceiling and floors, big windows framing those lovely views. There’s a dining table for six, a kitchen with all you need (including a juicer), and the sofabed. Downstairs to the bedroom: light and airy with red tiled floor, a huge bed, a tiny basic bathroom, and doors opening to the garden (a work in progress). Magdalena runs a language school from another building on-site and you’re welcome to hang out in the television room with its vast TV (all the channels), comfy sofas and wood-burner. There’s a town nearby for supplies and you’re just 10 km from Portugal. 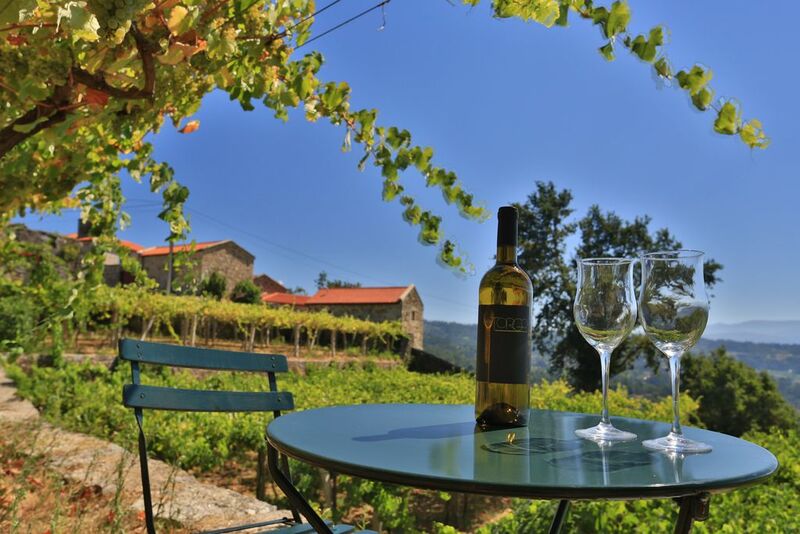 Visit hot springs, go wine tasting, Santiago de Compostela is a 90-minute drive. Magdalena (energetic, well-travelled, excellent English) will happily organise stuff for you to do. We have stayed in quite a few places in Spain over the years but A Pampla is by far the best! We arrived to such a friendly welcome from Magdalena and Javier. The location is beautiful with views across the vineyard to Portugal. The fabulous cottage has such a calming aura. You are instantly relaxed. A Pampla is ideally located to explore this corner of Spain, and Portugal is only ten minutes away. We didn't want to leave but left knowing that we had made good friends with Magdalena, Javier and their dogs, and that we are already planning our return trip. A Pampla was the most wonderful week away from a busy city. Magdalena and her husband were the most welcoming host's, who couldn't have done anymore for us. The little cottage was perfect with beautiful views out of the bedroom window and a very well appointed kitchen! I had Spanish lessons with Magdalena, which were brilliant. You must go and stay at A Pampla, it's idilic! Staying at A Pampla resulted in the best vacation of our lives and, we vacation a lot. Our stay here included language immersion, cultural experience and accommodations. Every morning there were pastries or breads awaiting us before our Spanish class. After class Magdalena arranged cultural and food and wine experiences that were spectacular and fun. She and Javier spent much time with us immersing us in the language and Gallego culture. They are such generous, kind and fun people. Word limitation prohibits me from going on but, if you are thinking of staying here, stop thinking and go. A Pampla is a really lovely little cottage, ideal for two people. It is very comfortable (although the sofa bed in the lounge would be better if it were just a sofa!) The views are splendid and rather impressive. Magdalena and Javier are delightful and very helpful hosts who leave you to do what you want to do but are always ready to answer any questions that you may have. They are very thoughtful and, when we arrived after quite a long drive, they gave us a jar of homemade soup and some Portuguese breads (which are amazing) to get us started. We loved the place and recommend it to anyone. We stayed one week in La Pampla and we enjoyed every minute of it. The stone cottage was outside real authentic and inside it was simple but beautiful furnished. I felt right away at home. Also the kitchen was very well equiped. And the quet rural surroundings were beautiful. And also was the vineyard. Magdalena and Gavi were very nice hosts and their wine was excellent. Unfortunately we did not see so much of Gavi but with Magdalena we had long interesting talks. She helped us with everything and more. It was such a pleasure to stay there that we regretted to leave. One of our favourite vacation spots ever. A perfect combination of a relaxing cozy vibe, in a peaceful property, surrounded by a vineyard with a magnificent view ! Doesn't get much better! Fantastic hosts who helped with everything we needed but also respected our privacy. All this and great wine as well. Certainly, we would love to go back to this low key cottage, which was equipped with everything we needed to cook and read about the area. Magdalena and Havee are lovely hosts and we wish them well in the future. Torgo is the delicious albariño wine produced next door. Tasting a couple of vintages as you enjoy the spectacular views in the vineyard where it comes from is an experience not to be missed. Every now and then a food and wine event is organised in our vineyard or at our favourite bar Cruceiro da Balsada, just ten minutes away. Take part at our wine tastings or any of the meetings we organise to enjoy local wine and food. Relax in any of the nearby natural hot springs and spas, especially during autumn and winter cool days. Don't miss Termas de Outariz and Prexigueiro, Mondariz Balneario or Portuguese Melgaço and Monção spa baths. All less than half an hour from A Pampla. Be a local...or learn the basics to become one. Take a Spanish course right here and you will feel closer to our culture. Learn how to order your drink at the bar, what to eat and when - a real immersion in the Spanish language and culture. Not only countryside: one hour and a half to Santiago de Compostela, an hour or less to Pontevedra, Combarro, Vigo, Baiona, Tui, Ponte de Lima (Portugal), Valença (Portugal), Allariz, Ourense. Even closer Ribadavia, or Portuguese Monção and Melgaço.